KANNAPOLIS, North Carolina (Oct. 3, 2018) – Aric Almirola and the No. 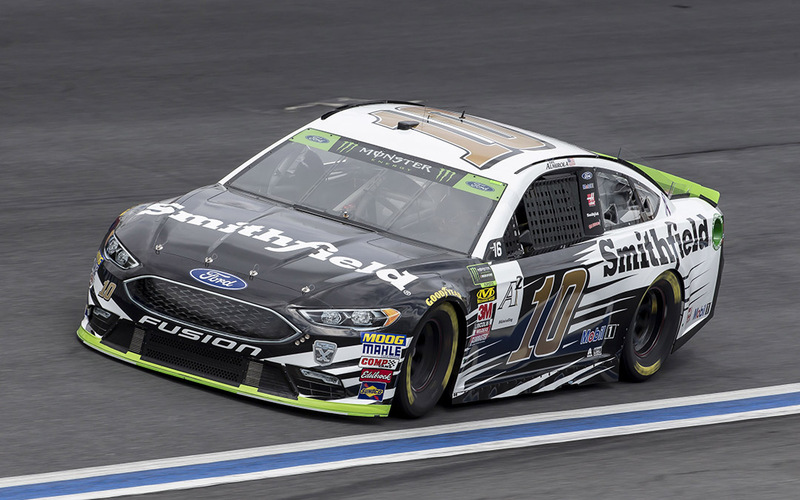 10 Smithfield Ford Fusion team for Stewart-Haas Racing (SHR) head to Dover (Del.) International Speedway this weekend for the first race in the Round of 12 in this year’s Monster Energy NASCAR Cup Series playoffs. The Smithfield team looks for a much calmer weekend after a dramatic but successful end to the Round of 16 Sunday on the “roval” at Charlotte (N.C.) Motor Speedway. • ​Aric Almirola will make his 274th career Monster Energy NASCAR Cup Series start this weekend at Dover (Del.) International Speedway. • Almirola is 11th in the playoff standings after last weekend’s 19th-place finish on the Charlotte (N.C) Motor Speedway roval. ◦ Almirola is currently fourth among his Stewart-Haas Racing (SHR) teammates in the playoff standings. • The Smithfield driver qualified 13th and finished 11th at this year’s May race in Dover. •Almirola reaching the Round of 12 in the playoffs is the furthest he’s advanced in the playoffs in his Cup Series career. • The 34-year-old has led 116 laps this season, the most in his Cup Series career. • The SHR team is the only four-car organization with all of its entries locked into the NASCAR Cup Series playoffs. •Fans can enter for their chance to win the Smithfield Smoke Machine Ford Mustang designed by team co-owner Tony Stewart and drifting champion Vaughn Gittin Jr. for Smithfield’s Mustang giveaway. Fans can enter for their chance to win the tricked-out street car and a trip to November’s Ford Championship weekend at Homestead-Miami (Fla.) Speedway by visiting SmithfieldRacing.com or by texting SMOKE to 82257. • Ford has 15 wins this season with 10 of the victories coming from the SHR camp – Harvick with seven, Clint Bowyer with two and Kurt Busch with one. Harvick also captured the $1 million grand prize with a victory at the non-points-paying All-Star Race at Charlotte (N.C.) Motor Speedway. • Johnny Klausmeier is in his first full-time season as a Cup Series crew chief. The native of Perry Hall, Maryland transitioned from an engineer to Almirola’s crew chief for the 2018 season. Klausmeier has one win as a substitute crew chief while filling in for Tony Gibson at Pocono (Pa.) Raceway in June 2016. As a race engineer at SHR, Klausmeier has worked with drivers Ryan Newman, Danica Patrick and, most recently, Kurt Busch. • Smithfield joined SHR this season and will be the primary partner for the majority of the season on the No. 10 Ford Fusion piloted by Almirola. Founded in 1936, Smithfield is a leading provider of high-quality pork products, with a vast product portfolio including smoked meats, hams, bacon, sausage, ribs, and a wide variety of fresh pork cuts. • The 2018 season marks the 10th anniversary of SHR. The Kannapolis, North-Carolina-based team is co-owned by Stewart and Gene Haas and has recorded 49 victories and 41 poles since its inception in 2009. Stewart won the 2011 NASCAR Cup Series title and Harvick gave SHR its second title in 2014. SHR’s Kurt Busch won last year’s Daytona 500, and Harvick won June 25 at Sonoma (Calif.) Raceway and Nov. 5 at Texas Motor Speedway in Fort Worth. Harvick scored back-to-back-to-back victories – Feb. 25 at Atlanta Motor Speedway, March 4 at Las Vegas Motor Speedway, and March 11 at ISM Raceway near Phoenix – then back-to-back wins May 6 at Dover (Del.) International Speedway, May 12 at Kansas Speedway in Kansas City, July 22 at New Hampshire Motor Speedway in Loudon and August 12 at Michigan International Speedway in Brooklyn. Harvick also won the non-points-paying Monster Energy All-Star Race at Charlotte. Clint Bowyer scored his two wins March 26 at Martinsville (Va.) Speedway and June 10 at Michigan International Speedway in Brooklyn. Busch captured the victory Aug. 18 at Bristol (Tenn.) Motor Speedway.